Nashville, Tenn. (January 29, 2013) – The National Hockey League’s Nashville Predators and the team’s exclusive regional television partner FOX Sports Tennessee, along with sister station SportSouth, today announced a new long-term television rights agreement. Financial terms were not disclosed. Under the new agreement, FOX Sports Tennessee and SportSouth will televise a minimum of 75 Nashville Predators regular-season games beginning in the 2013-14 season, reaching over 4 million cable and satellite households across Tennessee, Kentucky and northern portions of Alabama and Mississippi. The regional networks will televise 46 of the team’s 48 games in the current truncated season. FOX Sports Tennessee has been a Predators broadcast partner since the team’s inaugural season. 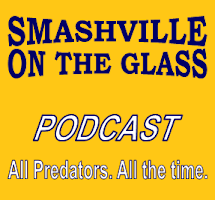 “The Predators are a valued partner with a passionate and loyal following. We’re pleased to reach an agreement that will make FOX Sports Tennessee the home of Nashville Predators Hockey for many years to come,” said Jeff Genthner, Senior Vice President and General Manager of FOX Sports Tennessee and SportSouth. Ratings for Nashville Predators telecasts on FOX Sports Tennessee and SportSouth increased 40 percent from the 2010-11 season to the 2011-12 season. The team’s 5.2 rating on SportSouth for Game Five of the 2012 Western Conference Quarterfinals against Detroit was the highest TV rating for a playoff game in franchise history, reaching 53,000 households. Keeping consistent with last year’s success, the Predators are averaging a 1.7 rating through the first several games of the season. The FOX Sports Tennessee broadcast duo of play-by-play announcer Pete Weber and analyst Terry Crisp are in their 15th season calling Predators’ action. In addition to game telecasts, Weber and Crisp co-host LEXUS Predators LIVE, an extended post-game coverage show after every game on FOX Sports Tennessee. Returning for his fifth season is Mark Howard, rinkside reporter for all Predators home games. Starting this season, Predators fans will see increased and expanded programming with further integration of in-game elements such as inside-the-glass features and bench hits as well as a new semi-permanent broadcast location in the FOX Sports Tennessee Zone inside Bridgestone Arena. Fans will benefit from cutting edge TV technology, such as FOX-MO, the network’s super-slow-motion replay system. Predators players and personnel continue to be featured in FOX Sports Tennessee original programs such as Predators Snapshot. The FOX Sports regional networks serving the Southeast – FOX Sports Tennessee, SportSouth, FOX Sports South, and FOX Sports Carolinas – collectively reach more than 12.9 million cable and satellite households in seven states across the Southeast. They are the television home of the Atlanta Braves, Atlanta Hawks, Carolina Hurricanes, Charlotte Bobcats, Memphis Grizzlies, Nashville Predators, New Orleans Hornets, and Indiana Pacers, as well as the Atlantic Coast Conference, Conference USA, Southeastern Conference, and Big 12 Conference, and offer expanded coverage of the University of Tennessee, University of Kentucky, and University of South Carolina. Combined, the four networks produce more than 800 live local events each year. For more information, please visit FOXSportsTennessee.com, FOXSportsSouth.com, and FOXSportsCarolinas.com. The NHL is back, so what now?